Hillsboro senior Quinn Conlon participates in the triple jump at Cedarville University on Saturday, Feb. 2, where he placed seventh with a distance of 37-0.75. 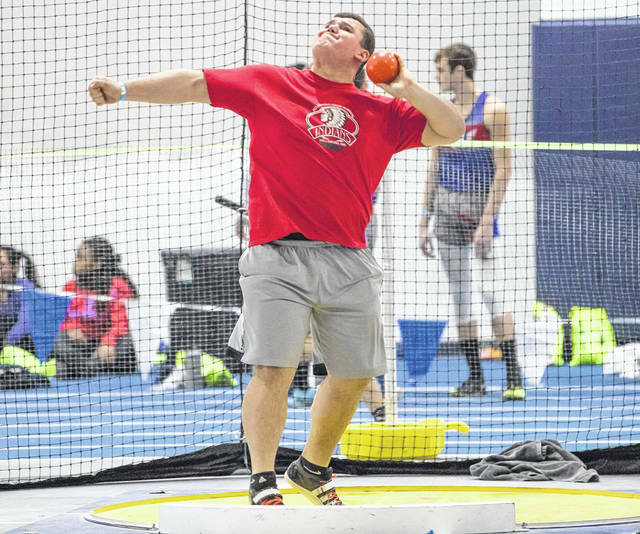 Draven Stodgel of Hillsboro took part in the shot put competition on Saturday, Feb. 2, at Cedarville University. Stodgel placed third at the meet and is currently ranked 11th in the state for the indoor track season. Two of Hillsboro’s top track and field athletes Quinn Conlon and Draven Stodgel traveled to Cedarville University on Saturday, February 2, where Conlon took part in the 60-meter hurdles, high jump and triple jump and Stodgel competed in the shot put. The boys 60-meter hurdles saw Conlon finish 28th in the preliminary race with a time of 10.32 seconds but failed to advance to the finals. Conlon performed well in the boys high jump competition where he advanced to the finals and finished in ninth place with a height of 5 feet 9 inches. In his best event, the boys triple jump, Conlon advanced to the finals and recorded a distance of 37.75 feet to earn seventh place at the meet and secure his spot at the seventh ranked triple jumper in the state. Stodgel completed in the boys shot put and was registered a throw of nearly 50 feet at 49 feet 7 inches that was good enough to earn him third place in the meet and solidify his spot as the 11th ranked boys shot put competitor in the state. 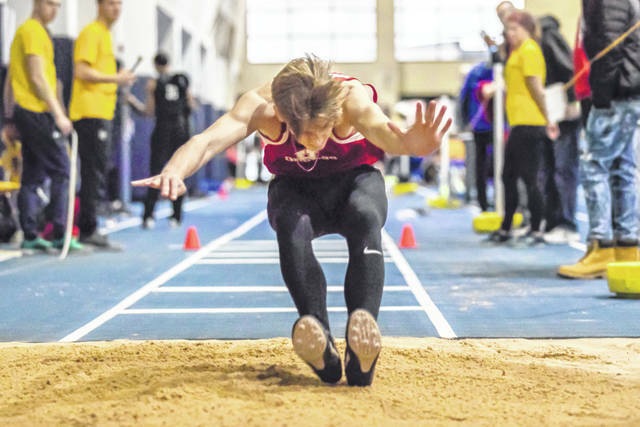 Conlon has been a fixture on the Indoor track circuit this winter with appearances at Otterbein University in Westerville on January 13 and at Tiffin University on December 2, 2019. The meet in Westerville saw Quinn take part in the 60-meter hurdles, high jump and triple jump and finish in the top 10 of each event. In the 60-meter hurdles preliminary Conlon was sixth with a time of 9.85 seconds and in the finals Quinn earned eighth place with a time of 14.74 seconds. The boys high jump finals saw Conlon take home fourth place with a height of 5 feet 4 inches and the triple jump finals resulted in the same fourth place finish with a distance of 36 feet 8.5 inches. At Tiffin University Conlon took part in the 60-meter hurdles and the triple jump. Conlon failed to advance to the finals in the 60-meter hurdles but, finished with a time of 10.54 seconds in sixth place. The triple jump was again Conlon’s best event as he finished in third place with a distance of 36 feet 7.75 inches. Also taking part in the meet at Tiffin University was Hillsboro’s Molly McCreary who competed in the girls 600-meter and 800-meter runs. McCreary was fourth in the 600 with a time of 1:58.52 and sixth in the 800 with a time of 2:56.64.